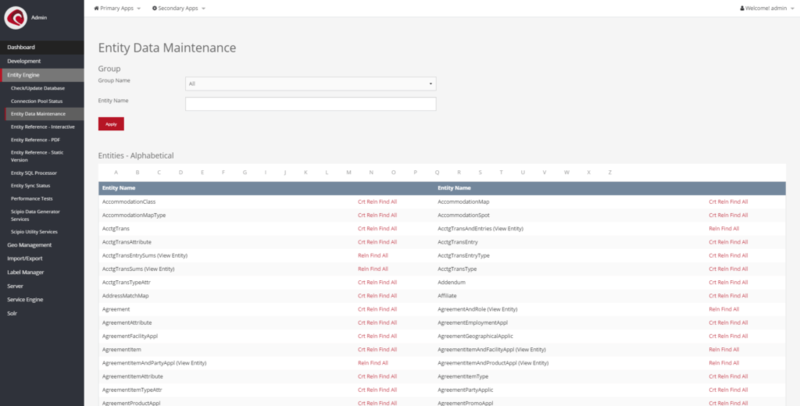 The entity engine provides you with database related utilities, such as data maintenance tools, auto-generated entity references, performance and status tools, as well as utility functions. “Entity Engine » Check/Update Database” can be used to run database specific actions, such as create/remove primary keys, remove specific entities (tables), update character set and alike. All database actions are permanent and can destabilize the system. Perform at your own risk! “Entity Engine » Connection Pool Status” lists the current state of the available connection pool(s). 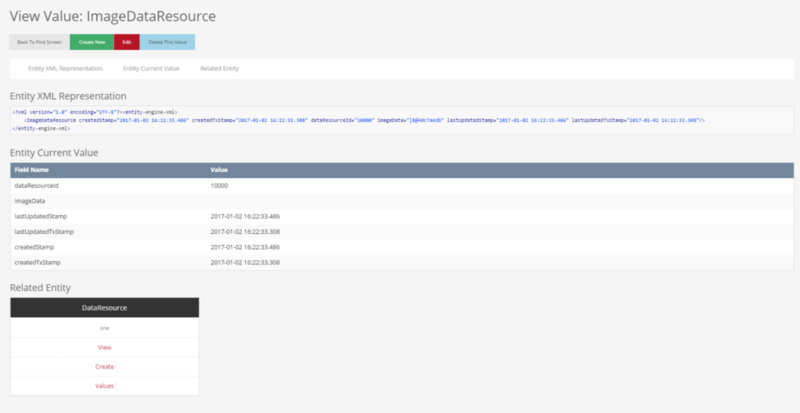 Can be used to review the current entity configuration. Generally speaking, this view is meant as an easy interface to navigate the database tables, view table information & relationships and create or edit individual database entries. The database table provides direct access to relationships (“Reln”), and the stored data via find (“Find”) or view-all (“All”) function. All entity relations are automatically listed, as they are defined by the entity definitions. Each relation will show the relation type and field. “FK Name” specifies the foreign key, which is being used inside the entity defintion for aggregation functions. Entity data is automatically listed inside of a table underneath the entity definition. The lastUpdatedStamp, lastUpdatedTxtStamp, createdStamp and createdTxtStamp are automatically added to each entity by the system. It is possible to view and delete individual rows, as required. It is important to understand, however, that each delete action is followed by a series of events, in which each relation is tested for now defunct relations. Delete actions will be rolled back and an error thrown, if the entry is required by a different, related entity. The view- action provides the current value, access to related values and an xml representation, that can be copied and used for seed- or imported data. Create & Edit actions are available to create and update new values. Individual SQL statements can be run through the “Entity Engine » Entity SQL Processor”. The entity-group “org.ofbiz” should be used for modifications on current system data (tenant is used on multi-tenant systems only). All SQL commands have to be entered without a trailing ‘;’. The camel-case used within the entity reference & data maintenance screens are auto-transformed, replacing the new words with a leading ‘_’. “Entity Engine » Entity Sync Status” lists the current entity synchronisation services, if required. Entity synchronisation is a concept mostly used in POS systems and not common for a generic ERP solution. If required, the tool can be used to trigger the synchronisation services and load external data remotely. “Entity Engine » Scipio Data Generator Services” lists a set of services that can be used to auto-generate demo data. The services provided are most useful for generating current data in development environments, where it is often required by developers for functional testing. Each service gives the option to set the number of records added and a limit to the time-interval in which they are created. “Entity Engine » Scipio Utility Services” provides entity specific services to reload data (mostly seed data) on runtime.